Edited by Ross I. Berbeco, Ph.D.
242 pages | 125 B/W Illus. This first dedicated overview for beam’s eye view (BEV) covers instrumentation, methods, and clinical use of this exciting technology, which enables real-time anatomical imaging. 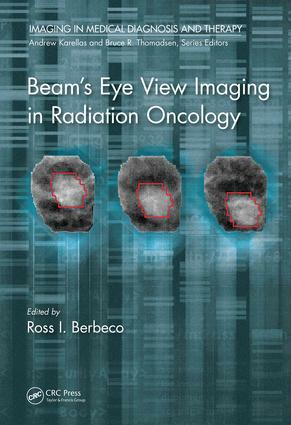 It highlights how the information collected (e.g., the shape and size of the beam aperture and intensity of the beam) is used in the clinic for treatment verification, adaptive radiotherapy, and in-treatment interventions. The chapters cover detector construction and components, common imaging procedures, and state of the art applications. The reader will also be presented with emerging innovations, including target modifications, real-time tracking, reconstructing delivered dose, and in vivo portal dosimetry. Ross I. Berbeco, PhD, is a board-certified medical physicist and Associate Professor of Radiation Oncology at the Dana-Farber Cancer Institute, Brigham and Women’s Hospital and Harvard Medical School. Ross I. Berbeco, PhD, is a board-certified medical physicist and Associate Professor of Radiation Oncology at the Dana-Farber Cancer Institute, Brigham and Women’s Hospital and Harvard Medical School. He earned his PhD in High Energy Experimental Physics at the University of Michigan before transitioning to medical physics. Dr. Berbeco began a beam’s eye view imaging workshop during his postdoctoral fellowship at the Massachusetts General Hospital and has since continued to research BEV imaging for tumor localization to facilitate applications like delivered dose reconstruction, adaptive radiation therapy and tumor tracking.